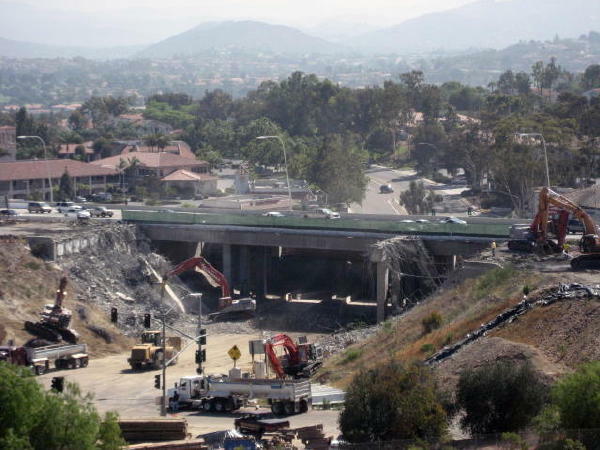 To alleviate traffic congestion in the North San Diego Inland Corridor, Caltrans recently undertook a major freeway expansion project on Interstate-15. 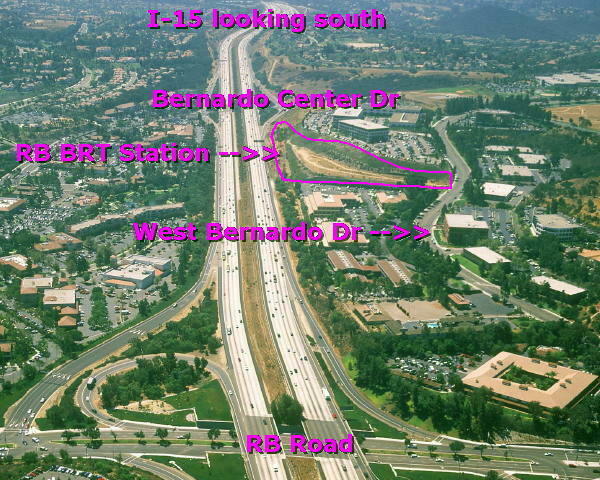 Rancho Bernardo benefits from the "Middle Segment" which runs north on I-15 from Ted Williams Parkway (Route 56) to Center City Parkway just north of Lake Hodges. 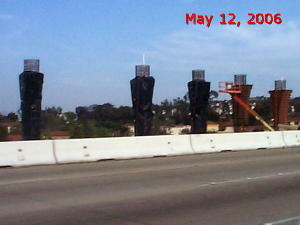 In general, the project has resulted in 6 additional freeway lanes, increasing from 8 lanes to 14 lanes in most areas. 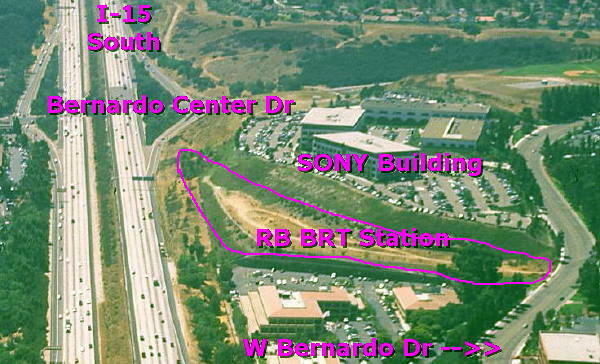 The "Middle Segment" runs through Rancho Bernardo and includes the Rancho Bernardo Transit Center. 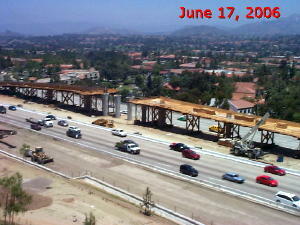 The I-15 southbound bridge over Bernardo Center Drive was completed in less than 9 months and is carrying traffic again. The photograph was taken on Wednesday, March 26, 2008 at 4:30 pm by George Cooke. In addition to adding a northbound and southbound lane on the freeway, the project will result in a new "freeway within the freeway". Commonly known as HOV (High Occupancy Vehicle) lanes or carpool and transit lanes, this new "freeway within the freeway" will consist of four lanes. Unlike the exisitng HOV lanes that run between Ted Williams Parkway and Route 163, the new HOV lanes will always run in both directions, and will allow entry and exit from the lanes at various points along the route. They are referred to as "Managed Lanes" because they can be "managed" by a zipper barrier that will separate the north and southbound lanes. 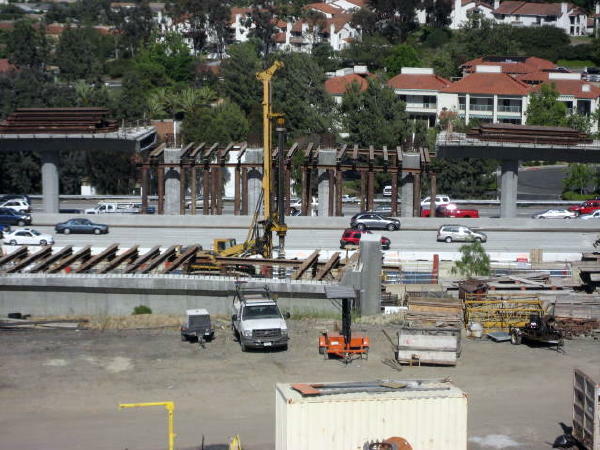 Similar to the divider on the Coronado Bridge, this will allow the lanes to be managed to accomodate traffic demands at different times in the day. In the morning, for example, there might be 3 southbound lanes and 1 northbound lane; while at mid-day it could be changed to 2 and 2. 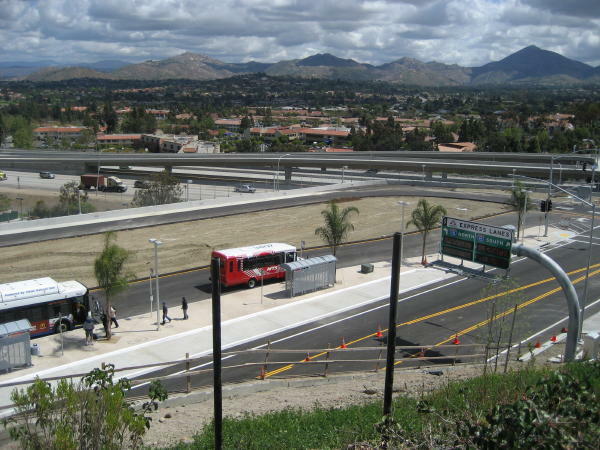 A series of Bus Rapid Transit stations are being built along the freeway, through a coopertative effort by Caltrans and SANDAG. Operating much like trolley stations, they will include park and ride facilities, and serve as a bus transfer point. 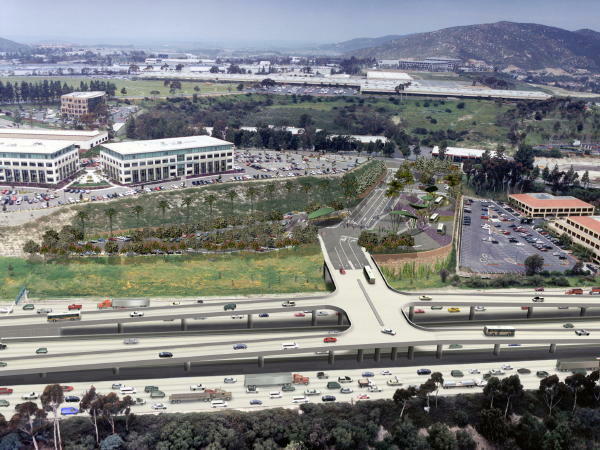 This innovative project will allow transit vehicles on I-15 to quickly exit and enter the BRT stations directly into the I-15 Managed (HOV) lanes, and will offer a mass transit alternative for weary commuters. The stations will be located in Escondido, across from North County Fair, in Rancho Bernardo, at Ted Williams Parkway, and eventually in Mira Mesa. 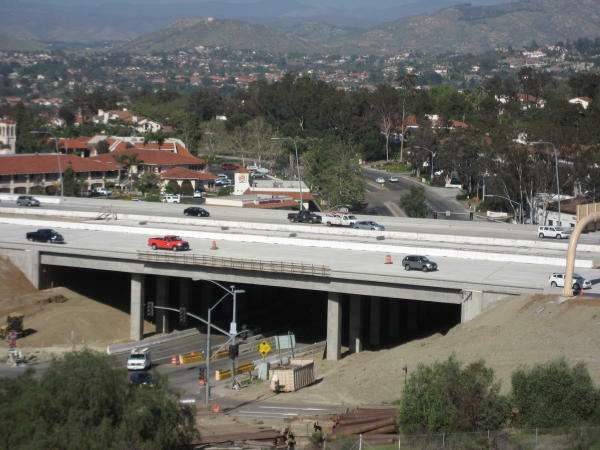 A milestone in Rancho Bernardo’s history occurred earlier this year when the new Rancho Bernardo Transit Center on West Bernardo Drive opened its direct access ramps to the I-15 Managed Lanes project. A park and ride lot and bus transfer area also opened, although construction on the actual Transit Facility is still about two years away. The new transit center is already getting a lot of use by carpoolers, commuters, FasTrak users, and transit riders who have discovered the convenience of its direct access to the I-15 (HOV) Managed Lanes. The new street that runs through the center is named to recognize George Cooke, a community volunteer who was instrumental in its planning. George Cooke Express Drive connects West Bernardo Drive with the freeway’s direct access ramps, providing easy access to the transit station and the Park-and-Ride facilities. According to George Cooke, this is a tribute to all the community volunteers who got involved working with government officials and transportation planners to find the best possible location for the new transit center. One example is longtime RB Planning Board member, Richard Walker, who created the vision for a pedestrian bridge that would extend from the Transit Center to the east side of RB near Webb Park. Caltrans designed the ramps with this in mind, so the “Walker Bridge” might be a possibility in the future. 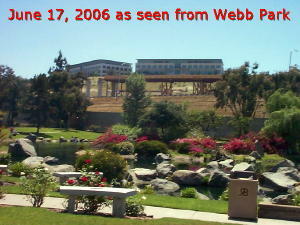 The community of High Country West was a central player in this project. Residents who were here nine years ago remember the original proposal which called for development of the transit station on High Country West’s designated open space hillside. High Country West residents saw those plans for the first time when they were presented by transportation officials in a meeting at the HCW Club in March, 2000. Needless to say, there was opposition, and an uphill battle began to convince government and transportation officials to relocate the RB Transit Center to its eventual location in the RB Business Park. The grassroots campaign that ensued was an outstanding example of the community and residents coming together to protect and improve their community. The campaign started with a petition drive, and was followed by years of meetings, public hearings, workshops, letter writing, news stories, TV interviews, and lobbying with public officials. 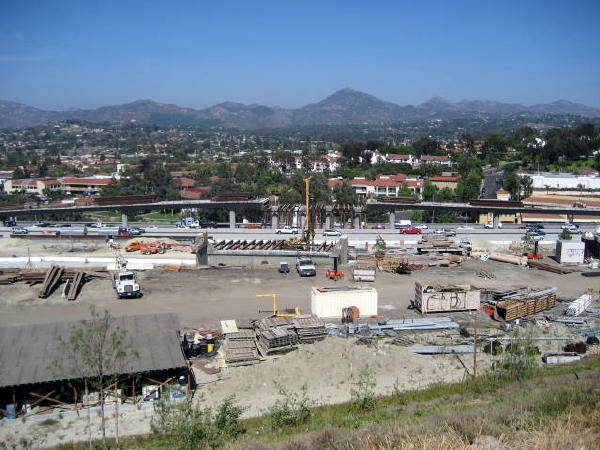 The new Transit Center is poised to become a Rancho Bernardo landmark, bringing innovative regional transit services to Rancho Bernardo residents and to the businesses up on the hill. For more information about the I-15 Managed Lanes project and the Transit Stations along I-15, you can visit the TransNet website at KeepSanDiegoMoving.com. 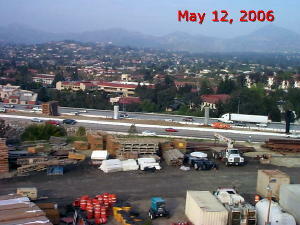 This photograph (provided by SANDAG, all rights reserved) with computer simulation, shows the concept of how the Rancho Bernardo BRT will directly access the I-15 Managed Lanes via a series of "Drop Ramps". On April 8, 2009 the RB Transit Center has begun operations and is handling some express bus routes. 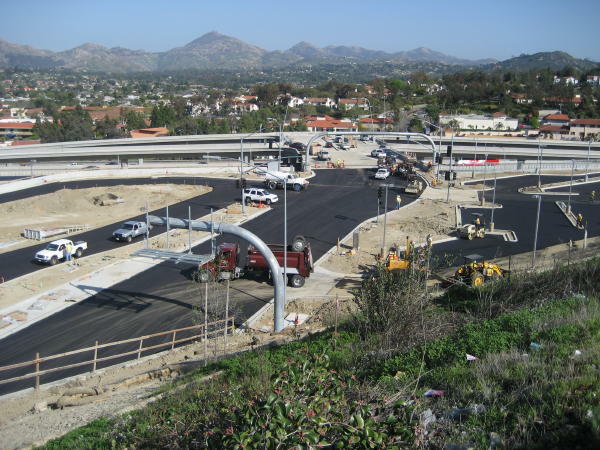 On March 10, 2009 the parking lots and driving lanes are being paved and the Rancho Bernardo BRT Station is preparing to open on a limited basis. In a few more years the complete station will be constructed. 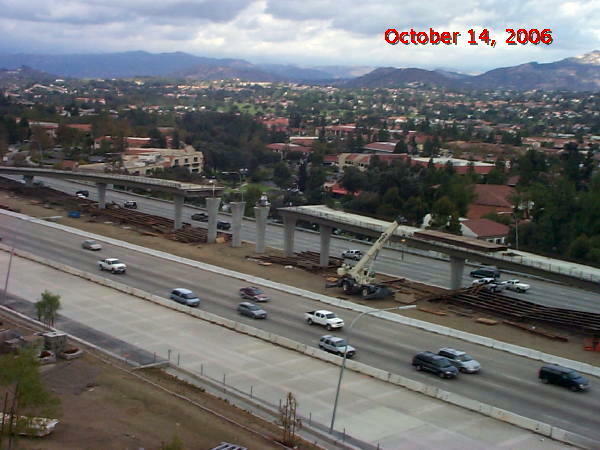 The supports for the Drop Ramps are currently under construction on I-15 at the location of the future Rancho Bernardo BRT station. 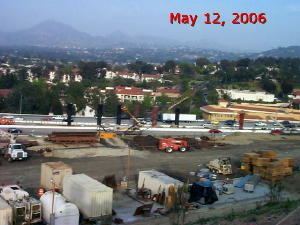 The following photographs show the progress. Work has begun on the piers for the southbound ramps, and for the bridge that will connect the HOV ramps to the RB Transit Center. 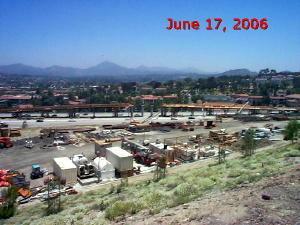 This photo shows the progress as of June 22, 2007. 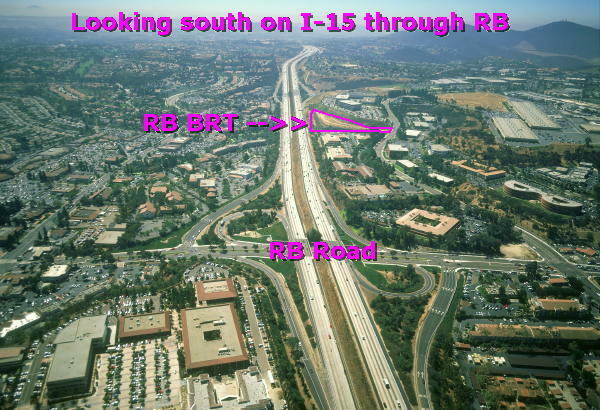 The Rancho Bernardo BRT will be located on the west side of I-15 halfway between Rancho Bernardo Road and Bernardo Center Drive. It is just below the SONY Building on West Bernardo Drive. 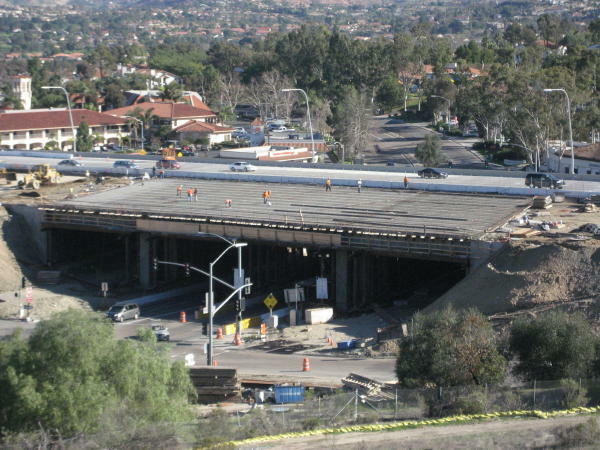 Construction has already begun for the Drop Ramps that will connect the new I-15 Managed (HOV) Lanes with the Rancho Bernardo BRT. You can click on any of the following links for additional information. 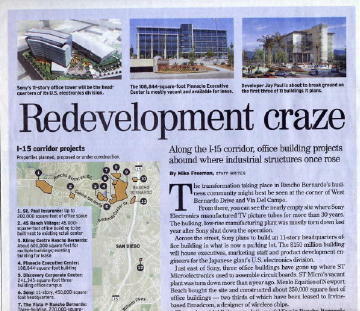 Projects are also underway in the Rancho Bernardo Business Park where a "Re-development Craze" is underway. Click here to find out about the Major Developments underway at the Rancho Bernardo Business Park.